Google apparently wants out of the pay-TV business, which it delivers to customers over its fiber network. And who wouldn’t with market dynamics like these! Google provides 150 pay-TV channels in a bundle with its 1Gbps broadband service for $130 a month in its Kansas City market. Similar packages from Comcast, with 200mbps broadband and 140 channels of TV, cost $103-$130 after the promotional period. Mr. Levendos hinted that Google may opt out of providing pay television services completely, instead relying on OTT video providers to fill the entertainment gap for its customers. Would it be a bad decision for Google to drop pay-TV service? Looking at Dish Network’s results, it could be a really good idea, at least from a financial point of view. The dynamics of the pay-TV business simply aren’t sustainable over the long term. 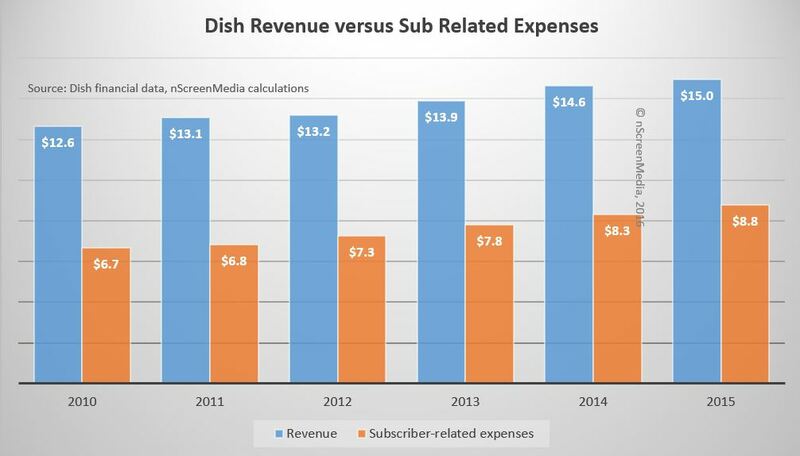 Between 2010 and 2015, Dish Network has done a creditable job increase revenue. In 2010 the company earned $12.6B, and in 2015 the company earned $15B. That’s an increase of $2.4B, or over 18%. Unfortunately, virtually none of the revenue trickled through to the bottom line. Subscriber related expenses, primarily comprised of content license fees, increased from $6.7B in 2010 to $8.8B in 2015. That’s an increase of $2.1B, or 32%. In other words, virtually all of the revenue increase went directly to the content providers. This trend of content cost increases outstripping revenue increases has been in place for almost a decade and shows no sign of letting up any time soon. If things continue the way they have been for the last four years, nearly 80% of revenue will go directly to the content providers by 2025. However, the business will have become hugely unprofitable for Dish Network well before that. The sad truth is that Dish is likely getting a much better deal from content providers than Google. 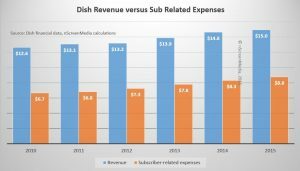 Dish’s 14M subscribers give it a lot of leverage in negotiations with the likes of Disney and Viacom. With under 60,000 subscribers, Google has no leverage at all. It would not be a surprise if Google was actually making a net loss on its pay-TV business. Similarly situated telco operators, such as Ringgold Telecom in Georgia, have made the decision to shut down their pay-TV business because it was just too unprofitable. Despite the probable loss, there could be other reasons why Google will continue to offer television, despite Mr. Levendos’ complaints. Many customers value the convenience of a single bill, and bundling together broadband, TV, and phone brings with it additional savings. Comcast reports that 70% of its customers take 2 or more of its services. However, Google could build a credible OTT bundle without running its own pay-TV business. The company could work with Sling TV, which just started trialing a service which includes local Fox affiliates, to deliver a flexible skinny bundle of channels. It could also partner with SVOD providers like Hulu, Netflix, and HBO to deliver premium TV services. All of these should perform very well on the 1Gbps broadband, and could well end up costing customers less than they are currently paying for traditional pay-TV service. Google is unhappy with the economics of its pay-TV service which it delivers with Google Fiber. It is very likely Google is losing money on the service. This could make an SVOD partnering model a much better deal for Google and for many of its customers. for USING their Fiber Lines, Satellites, and Cables. CORRECT the Screw-UP that started this problem. The PROVIDERS always made their money from the COMMERCIALS. NOW they get it DOUBLE. (from Commercials and the Viewers) What happened ??? When TV First started, the Channels made a FORTUNE from the Commercials. System worked GREAT !! No one came to your house and DEMANDED a Fee for you to use your Antenna. Now, the stations want it ALL. This would also STOP the Blackouts, fights about license fees, and Eliminate the Skinny Bundles. HBO, Showtime, or any “Commercial FREE” Channel Charges a “Small Fee” to cover their expenses for the Movie rights.